The collection would release on Xbox One, PS4, PC, and Switch simultaneously. According to Let's Play Video Games, a website with a reputation for breaking accurate Switch rumors, Bandai Namco and FromSoftware have a build of Dark Souls 3 running on Nintendo's upcoming platform. Purportedly, a small team inside FromSoft has been working on the port for a few months and have attained "a level of performance they are happy with." LPVG stressed that work on the port could be nothing more than experimentation by the developers to put Nintendo Switch through its paces, and that FromSoftware wants to see how Switch performs at retail before committing. 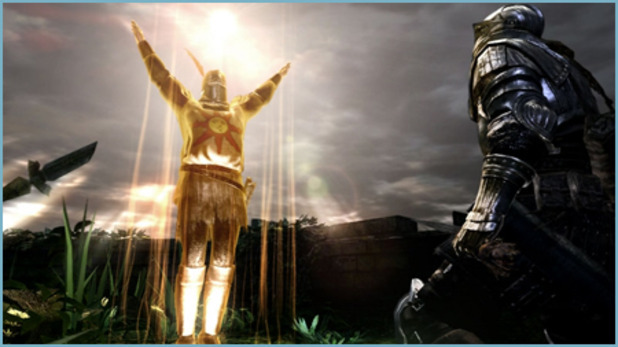 However, FromSoft's and Bandai Namco's logos appeared on Nintendo's early list of confirmed third-party publishers. On top of that, LPVG's source claims that both studios are toying with the idea of releasing a Dark Souls trilogy on Switch, as well as Xbox One, PS4, and PC. Craddock's Corner: For me, this is the most exciting Switch-related news yet. No Dark Souls has found a home on Nintendo hardware thus far. In a two-firsts-for-the-price-of-one special, a collection on Switch would carry the distinction of being the first handheld incarnation of the series. Dark Souls in my pocket, available to play anywhere, anytime. The very thought has my jam-packed schedule ducking for cover until 2018. Shack Meets: All Dark Souls, all the time. JUST IMAGINE. Will they be selling the console/Dark Soul bundles in 3-packs? Because I will need three. Probably not because they know they can charge you more if they don't.